Notifications. You can now stay in touch with your attendees/guests with SMS and email notifications. Send a reminder message before your event or let them know of any changes. Stay connected! Ability to select table shapes on a seating plan- You can now select a rectangle or round table. Live chat is now available in more locations. No cost refunds. There is now no cost to the organiser or ticket purchaser for refunds. All booking fees are fully refunded. Organiser Page- the current event list view on the organiser page has now been increased to 20 events. ‘Order Success’ button. Add a customisable button on the ‘Order Success’ page. Split payments- the fee for split payments has been reduced. Recurring events- Organisers can select the recurring frequency of their events, ie daily, weekly, monthly. Add to Calendar function- allows reminder intervals and add hyperlink. Geolocation- Identifies the location of the ticket purchaser and lists all relevant events by the organiser nearby. Sales page- Add ticket holder name to the sales list page. Stay tuned and stay in touch- we’re already working on more! 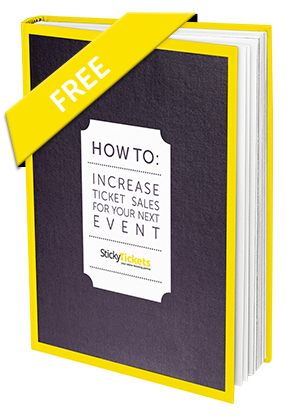 This ebook has seven of our favourite tried and tested methods for increasing ticket sales, and most of them don’t require a lot of work or expense on your part. How Are Your Events Looking for 2019? If you’re promoting an event or you’re involved in its organisation, don’t let your hard work go to waste with poor ticket sales. Implement these suggestions to help your tickets move fast and create a buzz around your next event. 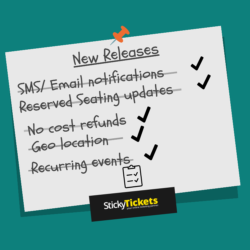 Anyone can sell tickets to their event using Sticky Tickets! They’re perfect for movie nights, charity dinners, training courses, book launches and much more.